No, this is not the long-awaited follow up to 1997's Creature Of The Velvet Void. But take heart dear reader because this is the next best thing. 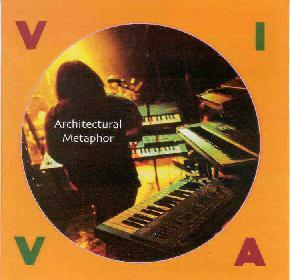 Viva documents Architectural Metaphor's performance (not the whole set) at the Quarkstock 2000 Space Rock & Avant-Prog festival held over Memorial Day weekend 2000. This amazing festival (covered in AI #11) will always be a fond memory for me as it featured some of the cream of the current crop of space rock bands and was held a mere 3 miles from my home. I'd not yet had the opportunity to see Architectural Metaphor perform live and though I knew I wouldn't be disappointed I wasn't prepared for the powerhouse performance that was in store. Viva includes 4 unreleased tracks, a killer cover of "Kairos" from the Creature CD, and a 23 minute cover of Pink Floyd's "Echoes". Though not on this CD, the band also did a cover of Tangerine Dream's "Richochet", which was appropriate given that in their own music the band meld both Floyd and the Dream into their own unique sound. Viva opens with "Overture 1369", a fiery instrumental intro piece consisting of heavy symphonic keyboards from Paul Eggleston, steady drumming from Deb Young, and screaming heart attack guitar licks from Greg Kozlowski who had enough efx devices to occupy a significant portion of the stage. "Sur Le Tour" begins with a buildup of rumbling tripped out space guitar efx against a dark keyboard backdrop. The guitar then takes over playing a slow melody, but each note is a statement in itself. I always considered Dave Gilmour to be one of the most tasteful and emotional guitarists in rock for his ability to blow away the listener more with a single note than the most pyrotechnically proficient guitarist could do with a zillion... so hopefully this gives you a feel for the playing heard here. Kozlowski's guitar is even more potent against Eggleston's intensely heavy symphonic keyboards. The nearly 9 minute track includes a taste of Deb Young's haunting vocals though it's mostly instrumental. "The Maker" and "For A Few Moments" are equally potent tracks, the later being a dark atmospheric song featuring Deb Young's vocals more prominently than on the rest of the album. "Kairos" is a killer track featuring evolving Tangerine Dream styled keyboard patterns and the most varied guitar efx on the album. The keyboards and guitar really combine their efforts to make hauntingly atmospheric space landscapes that simultaneously float and scream and burst the mercury for the intensity levels it reaches. If you think all those guitar efx devices on the stage are just for show then check out this track. Truly Architectural Metaphor at their very best. And the band do a fine job of presenting their own interpretation of "Echoes", just as they have with several other classic songs. In summary, if you liked Creature Of The Velvet Void you should waste no time getting your hands on Viva for some primo live space rock. I think there's a lot here that prog rockers would enjoy too due to the symphonic quality of the keyboards and sheer melodic intensity of the guitar work. For more information you can email Architectural Metaphor at Greg.Kozlowski.B@bayer.com. Contact via snail mail c/o Greg Kozlowski; 72 Tulsa St; Springfield, MA 01118.